Your home is literally crawling with bugs, according to a new study published in the journal PeerJ. Thanks to the first comprehensive census of the bugs living in our homes, scientists now have a pretty good idea of exactly which creepy crawlies are snoozing in your bedroom, rifling about in your kitchen and doing whatever it is bugs do in the bathroom—at least, if you live near North Carolina. A few disclaimers, before you run into your attic to kill whatever demonic creature is called a "firebrat." First of all, three extremely common bugs were found in almost every room of every house—ants, cobweb spiders and carpet beetles—and so we excluded them from the analysis. Aside from those three, the bugs depicted above are among the most common species (each was found in that particular room in more than 50 percent of cases). Also, this data applies specifically to North Carolina and similar regions with similar climates. If you live on another continent (or even on another coast) your local bug population is likely to be quite different. 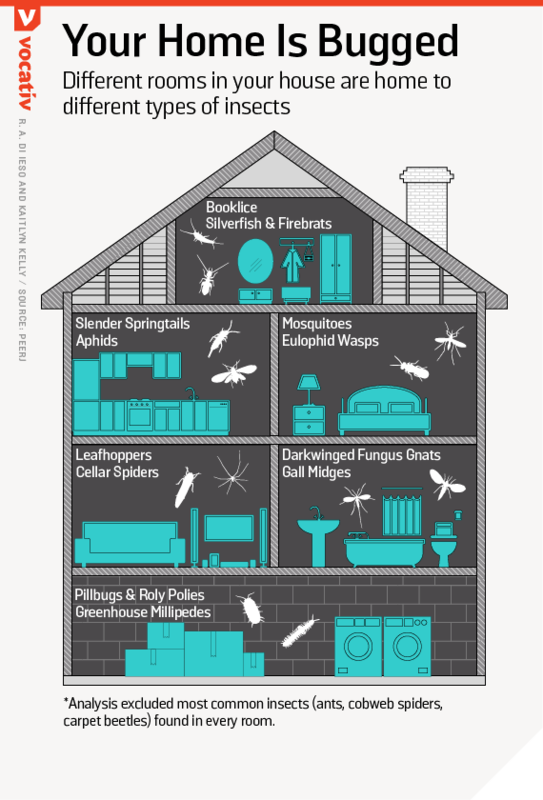 The researchers found that each home contained about 93 unique arthropod orders, with especially large numbers of flies (found in 23 percent of rooms), beetles (19 percent), spiders (16 percent) and ants (15 percent). Not a single home was entirely free of bugs, and only five out of 554 rooms were declared bug-free. Surprisingly, pest species were far less common than benign species. "Biodiversity in urban landscapes is richer than was once thought, and we find here that the indoor, manufactured environment also supports more diversity than anticipated," the authors write. "Further research...is needed to understand the potential economic and health implications of the species that live and have evolved in such close proximity to us." The post Your House Is Crawling With Bugs appeared first on Vocativ.